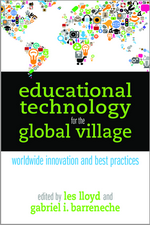 Educational Technology for the Global Village, Edited by Les Lloyd and Gabriel I. Barreneche | Information Today, Inc.
"Provides educators and community activists a strong framework for service-learning with multiple examples of how students, faculty, and staff can engage with the community in purposeful and meaningful ways. Readers will be energized and inspired by how technology can serve as a vehicle for progress, education, learning, and hope." With this timely book, editors Les Lloyd and Gabriel Barreneche present an eye-opening look at projects that are innovating with technology to improve education and, indeed, the very quality of people's lives around the world. From collaborative learning communities and social networks to Web 2.0 tools, MOOCs, and mobiles, experts discuss an array of tech initiatives that teach students to think and act globally while helping to close the education gap between developed and developing nations. Contributors explain how students and institutions can reuse "obsolete" technology in places where it will be "new" and describe the impacts of such efforts on communities abroad. If you are interested in service-learning, internationalization, and study abroad—or if you are just looking for a way to keep your organization's old technology out of landfills—Educational Technology for the Global Village will inform and inspire you. "In a world that is becoming more interdependent and interconnected with each passing day, this book represents an indispensable tool for fostering intercultural awareness and promoting global citizenship through technology." "Educational technology can change the world ... This book is a great start!"